Where is the camping located? 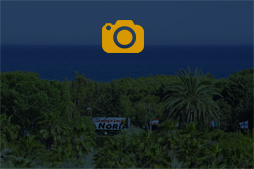 The Camping La Noria is located in Torredembarra, by the seaside. How far is the camping from the beach? We are situated on first line by the seaside, with a direct access to the beach. How far is the nearest village? The nearest village Torredembarra is about 1 km away. How far is Port Aventura? How far is the Reus Airport? How far is the Barcelona Airport? No, there is no swimming pool. We are just next to the beach, though. The Camping La Noria is situated on the “Els Muntanyans” beach, which has fine sand and a very slight slope, which makes it very suitable for children, as the water doesn’t cover you to top until several meters from the shore. Its length of more than 2 km is home to the last remaining sand dunes and brackish wetlands (beyond the Ebro Delta region). Is there any beach to practice nudism? On the “Els Muntanyans” beach, where we are located, there is a preferentially nudist area of about 300 meters, which is marked accordingly. It can be reached within 300 meters from the Camping’s entrance to the beach. How many cars are permitted per accommodation? Only one car per pitch or other type of accommodation is permitted. You should always park it within the pitch or in assigned areas. Do the pitches have water connection? NO, there are fountains and water points all around the camping, but the pitches don’t have direct water connection. What power supply do the pitches have? Las parcelas disponen de 6 amperios de potencia. The pitches have a 6 amp power supply. Is there a fridge rental service? YES, please ask for more information at the reception. It is allowed to barbecue within your own pitch and using the charcoal or gas barbecues only. You should always take appropriate safety precautions. Open fire is forbidden. Can I do the check-in at any time? The reception opening hours are from 8 am till 10 pm. What time do I have to leave the pitch? Do you rent pitches for the whole season? Yes, according to the availability. Are dogs allowed in the camping? Yes, dogs are allowed on the pitches, except for dangerous dog breeds and their mixes. How many people can stay on one pitch? A maximum of 6 persons can stay on one pitch. YES, there is a laundry with washing machines and dryers in the camping. Until what time can we get in with the car? The access barriers to get in and out are closed between 12 pm and 7 am. Nevertheless, you will be able to walk in and let your car outside on the assigned parking. Yes, paying by card is accepted. Is there WI-FI connection to connect to the internet? What is its Price? Yes, there is WI-FI connection all around the camping. It is free. What is the address of the camping? And the GPS coordinates? Is there air-conditioning in the bungalows? The mobile-homes Antina, Xalet and Classic have air-conditioning. NO, pets are not allowed in the bungalows. What time do I have to leave the bungalow? Is bed-linen included in the bungalow’s price? SI, la ropa de cama, están incluidas en los Antina y los Xalets. YES, bed-linen is included in case of mobile-home Antina and Xalet. Are there any performances and activities for children? YES, there are several types of activities and performances, for both, children and adults. It depends on the season, though. From what age can children be accepted in MINI-CLUB? NO, the camping does not offer such service.